It's been fun featuring a new weekly item these last few weeks! There's always so much that goes into each design, from mining my life for inspiration, to figuring out how to streamline the production, to creating a prototype and giving it a test-run (which basically means I wear the piece for a few days to see how it wears, then I make any necessary tweaks to the design), to photographing each piece for listing on my web-shops. This week I'm featuring my Petal Earrings. These are such a great classic staple for any wardrobe! I was inspired by flower petals (specifically lotus flower petals) in creating this design, hence the name. With their monochromatic coloring and small, delicate nature you can throw these on and just about forget you're wearing any earrings at all. As my offer to you this week, these earrings will be available at 1/2 off in my shop through next Monday when I'll have a new item-of-the-week for your enjoyment! That makes them only $16.50 per pair (plus shipping and any applicable taxes of course.) Simply use the discount code petal and you're on your way to your new favorite pair of everyday earrings. This week I chose to feature a classic Tangleweeds design: the Swoops Earrings. I love this design. It's one that I am especially proud of and that my customers seem to love (thank you!) Last year I rolled it out in even more stone options, like the moonstone pictured below. I remember when this design came to life. I was still working in my garage studio (which was also my living space - yes, folks, for the first year and a half running Tangleweeds I rented a garage bedroom that doubled as my studio!) It was a rare afternoon where I had some time to mess around with creating metal components. I had made a bunch of these curved metal bars and simply decided to turn them vertical instead of horizontal. The nice effect of this design is the way they swing and dance as the wearer moves about. They're also very lightweight - one of my Tangleweeds signatures. My *special offer* on this design is 35% off with code swoops through next Monday. Click here to shop the Swoops, or click on either of the images above. 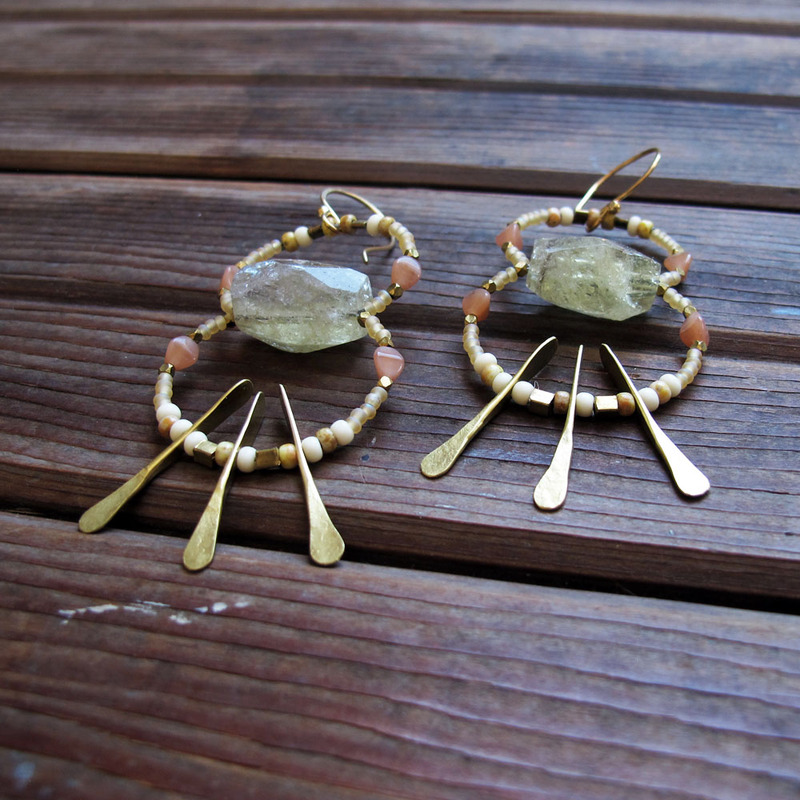 And, P.S., these make for a great Valentine's Day gift for any gal that likes long earrings!